When I was a kid, I loved going to McDonald’s with my grandparents. I got a cheeseburger happy meal and sometimes got a sundae for dessert. It was a treat I grew accustom too. During my teenage years, my Mom decided to go to college. Time and money were limited so my sister and I often dined from fast food or pasta from a can courtesy of Chef Boyardee. 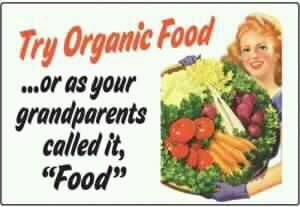 Let’s face it, the food today is not the food Grandma use to make! And we all should be concerned that the food on the shelves could out live us! When the national diet companies were not working and I was sick of being a slave to counting calories, I dove head first into the land of plant based foods. I was a self proclaimed Vegan. The difference between a Vegan and a Vegetarian is no animal products – no cheese, no sour cream, butter, milk, or meat. For all you cheese lovers, it can be done! When I started the journey on the Vegan lifestyle, I had no idea what was in store for me. My diet consisted of mainly something frozen, something boxed, with a splash of chicken here and there. I had trouble boiling an egg so how in the world was I going to cook every meal. This book, however, changed my world. Yum, yum, yum is correct Sara Kramer (see review on cover)! 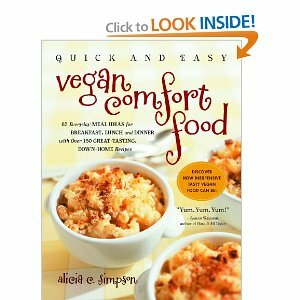 Alicia Simpson taught me how to restock my pantry, she defined the Vegan staples, and provided endless recipes for meals, snacks, sides, and desserts. Thanks to her, I am a well oiled cooking machine!! Everyday I discover something new – a new recipe for tacos, pizza, soup, and pasta. I love adding wheat grass to my smoothies and I opt for kale chips over potato chips. It’s all amazing and a delight for the tired ol’ taste buds!! I am not declaring that everyone go Vegan, but just wanted to share information on a lifestyle that has made me feel better than I ever have before! There are countless sites to help navigate you through this process. Oprah even did a segment on the Vegan lifestyle and her expert provided a starter kit (which kick started this change). If you are not quite sure about testing the waters, then here are a few movies that could very well change your mind. 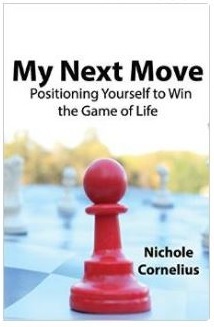 I needed this today Nichole! I am so tired lately and have started getting back to my comfort foods and nothing healthy…at all hardly. Thanks for this post. I’m encouraged again.